Mental health problems and addiction go hand-in-hand. What can you do if you are facing psychological problems with your child? We review a parental guide on coping with children’s mental health challenges that can help. Your communication with your child feels like it’s a one-way street. Various hormonal processes are taking over during adolescence. It seems like these processes have gotten stuck. So, how do you reconnect? These are just some of the issues described in Ann Douglas’ book, Parenting Through the Storm. Driven by her own children’s experience with psychiatric and learning disabilities, Ann Douglas felt that parents who face these challenges deserve to be heard. She wrote this book in the hope to help other parents whose children are diagnosed with psychological disorders. More on how to end the silence between you and your child and reach out for help here – with a section for questions and comments in the end. Ann Douglas wrote this book to broaden up parents’ perspectives about the challenges that await them during their children treatment journey. 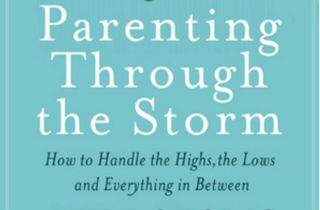 Parenting Through the Storm is a collection of different family experiences with psychological problems. This book intends to show parents who struggle with these issues that they are not alone. The idea behind the book is to offer parents of children diagnosed with psychiatric disorder(s) direction for help and educational resources. We think that the book achieves this goal. Reading it can help you to relate. You’ll see how other families overcome similar issues and share the load. What are the main themes in the book? Here’s what we learned. This section of the book includes detailed instruction about how to notice abnormal changes in your child’s behavior. You’ll also find a list of mental health indicators in children and teenagers which might come handy if you suspect any problems. The focus of this section is the importance of finding the right diagnosis that will describe precisely what’s going on with your child. Here, Douglas speaks about the importance of parents’ health and well-being, as well. When one member of the family is weak, others need to remain strong. To do this, we need to take care of ourselves! This part of the book broadens the perspective of readers to motivate them to look at other family members who need to adjust to live with a diagnosed member in their home. This includes lifestyle changes from each family member (parents and siblings) in order to maintain the strength of the family and help each other easily go through the process of recovery. This section of the book broadens up the picture of what it means to have a child with psychiatric problems. This involves the challenges of your child in school and during social interaction with friends which often time bully kids about their disorder. This part of Parenting Through the Storm looks at ideas for a better system of care for children with mental and behavioral health challenges. Who is this book intended for? This book is intended as a “first aid manual” to all parents whose children manifest signs of mental and emotional problems during their growth. Furthermore, Parenting Through the Storm aims to tighten the gap between recognizing your child’s struggles and being able to know what those struggles represent. We love and recommend this book because its a highly educational and practical manual for families who have children diagnosed with mental and behavioral health problems. Mental health issues are highly stigmatized in our culture. And when you ignore a mental health problem, risk of addiction as a co-occuring disorder increases. However, our connected experiences can help us grow personally, towards a united vision of holistic health. Parenting Through the Storm is a beacon of light along the way. One of the things that makes this book special is that it acknowledges the importance and well-being of the whole family system during a struggle with psychological problems. Parents of children diagnosed with psychiatric diagnoses will find some advice in this book on how to take care of themselves during this process which can be stressful. The problems of a one family member affects the whole system. This is why Ann Douglas approach is integrative, treating each member issue with equal importance as to the one facing the psychological disorder. An additional asset of the book is that it provides encouragement. Written in the form of a group memoir of those who have gone through the storm – successfully – this book offers hope and inspiration during a family battle with emotional and mental health disorders. We all need hope. Hope keeps us going. This book helps provide parents with the hope that things can and will get better. Additionally, if you are left with any questions about this book, we ask you to post them in the section below. We also welcome your feedback if you’ve read the book, and would like to comment and share your opinion. About the author: Ann Douglass is an award-winning parenting writer and the mother of four children who have struggled with a variety of psychological problems-and are currently thriving. She speaks widely at health, parenting, and education conferences. She also hosts online conversations about parenting and mental health for a range of organizations. With acclaimed books, including “The mother of All parenting Books” and “The Mother of All Baby Books” to her credit, Ann has helped hundreds of thousands of parents navigate the challenges and complexities of raising kids today. She lives with her husband and their youngest child in Peterborough, Ontario. Children and adolescent gambling problems: INTERVIEW with Don't Bet Yet!